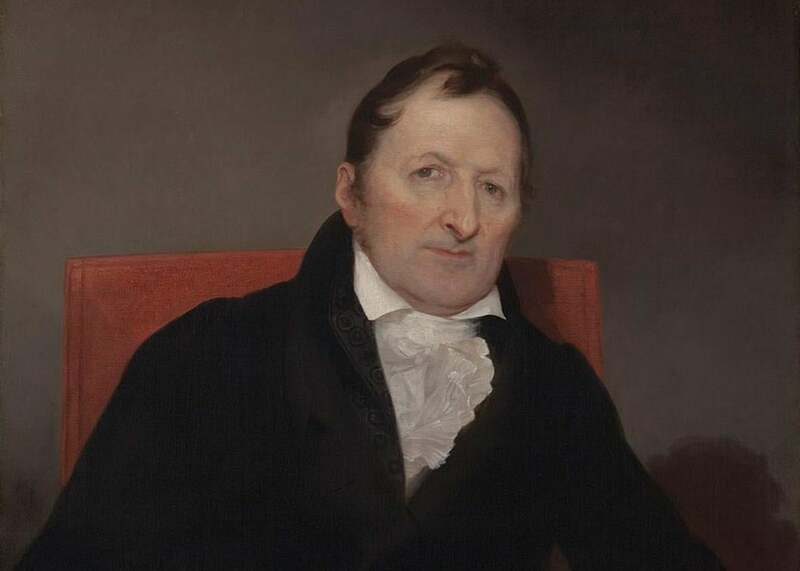 Eli Whitney, inventor of the cotton gin, wasn't black. But here's why so many people think he was. An 1822 portrait of inventor Eli Whitney, a white guy, by Samuel Morse. Why do we still need Black History Month? On its first day alone, this February provided two good answers. One is that we need it because our president and his spokesman seem to have no idea who Frederick Douglass was or even that he is not currently alive. But a second is that, mysteriously, it seems a large number of Americans believe that the inventor of the cotton gin, Eli Whitney, was black. @jbouie @ellievhall @rembert This was taught in my elementary school in suburban Kentucky. Didn't find out otherwise till HS in Boston. What’s going on? First things first: Whitney was white. He is not a mysterious figure. He was born in 1765 in Massachusetts to a wealthy farming family, he went to Yale, he married Jonathan Edwards’ granddaughter, and he died in 1825. Portraits composed during his own lifetime confirm that he was, indeed, a white guy. If they did believe in Whitney as a black hero of invention, it might be because plenty of authoritative sources told them as much. For example, here’s a Head Start classroom in February 1990 learning about “Black people from history” including Martin Luther King Jr., Willie Mays, and Whitney. The 1989 KRS-One song “You Must Learn,” an anthem on education and empowerment, lists Whitney among black inventors such as Garrett Morgan and Madame C.J. Walker. The video shows black men turning bales of cotton, over the mention of Whitney’s name. Bill Brown, the director of the Eli Whitney Museum and Workshop in Hamden, Connecticut, says that he has often heard the notion that Whitney was black. “It’s always difficult to link a legend to a source,” he told me by email. But several good guesses exist as the origin of the myth. For one, Whitney’s invention was so tangled up in black history that it is often taught during Black History Month in elementary school history classrooms and other sites of popular history. Patented in 1793, the cotton gin turned a labor-intensive crop into an extremely profitable one, boosting the demand for slave labor. Between 1790 and 1860, the number of slave states grew from eight to 15, and the slave population more than quintupled in the same period. * A Florida newspaper’s 1994 bullet-point list of “How Black Americans Helped Shape the Sunshine State,” for example, has one entry that reads “1793: Eli Whitney’s cotton gin leads to increased importation of slaves to work on cotton plantations.” It’s not claiming Whitney was black, but it’s understandable how a casual reader could interpret it that way. Since Whitney’s race is so well-established, it seems unlikely that textbooks exist with the explicit claim that Whitney was black—in any case, I was unable to locate any. (If you have evidence otherwise, email me.) But the fact that black inventors are a unit in many grade-school Black History Month curricula makes the mistake imaginable. If students are learning about George Washington Carver, Garrett Morgan, and Lewis Latimer along with broader black history, mistakes will be made. (I knew Whitney was white, but I remember confusing Carver and Jimmy Carter as a child: both famous Southerners with peanut-related stories and similar last names. And until I Googled Carver just now, I could have sworn he was from Georgia.) It can’t help that black inventor Elijah McCoy, son of fugitive slaves, has a similar name. (Some people insist Whitney’s name sounds black, and that’s what causes the confusion.) Meanwhile, there’s another commonly repeated legend that Whitney got the idea for his invention from a slave. All of these factors could easily contribute to elisions and conflations in classrooms where lessons on the entire sweep of black history are crammed into the shortest month of the year. Meanwhile, the irony of a black man inventing the tool that helped turn slavery into the economic engine of the antebellum South is just too poignant to resist. As a Reddit commenter put it, “I always remember the story of Eli Whitney because it was kind of sad in a way, because this black man had inadvertently created a tool that encouraged people to have more slaves to operate these cotton gins and also influenced the power of cotton as an economic tool in the South.” That Whitney had trouble profiting from his patent—a true, if complex, part of his story—adds a plausibly bitter note: A black man invents a machine that oppresses his own people, yet he’s kept from benefiting financially himself? It sure sounds like America. It’s almost like a sprawling, nationwide game of telephone. Speaking of which, did you know Alexander Graham Bell was black? *Correction, Feb. 8, 2017: An earlier version of this post misstated the number of slave states in 1790. There were eight, not six.